Chinese Garden Artwork - hedges gone troppo! Chinese Topiary, check it out... is this KITSCH or delightful art? Is this a seat? A throne for giants? La Vie en Chantant is a storey abouth the Belgium brown café Les Olivettes, where the common folk gets the upportunity to sing and perform, just to feel like a star for a short while. La vie en chantant is a documentary about the singers of Les Olivettes, the .café-chantant. in Liège, Belgium. You won.t find professional artists performing here, but regular customers. Here they can be stars for a short while and find the recognition they so sorely desire. On entering the café one early Sunday morning Les Olivettes is already packed. Les Olivettes is an old brown café that has not been renovated since the First World War. The many visitors come here not only for the beer and the wine, but especially for the singing. There is endless singing; opportunities for all kinds of regulars to air the soprano, alto, tenor, baritone or bass voice within them. How they sing! The whole French repertoire is reviewed, especially Brel, Bécaud, Brassens, Montand and Piaf. Some of the singers have even obtained such illustrious nicknames as The girl from Paris, The tiny waist with the great talent, Rudolph Valentino from Liège and The sonorous voice of Clermont sur Bervinne. So also the 83 year old Stéphanie, known as La petite maman des Olivettes. Each Sunday afternoon, her son takes her by car from Seraing to Les Olivettes in Liège where she demonstrates her talent. As a child everyone thought that Stéphanie would have a great future as a singer, but due to the death of her aunt, an opera singer who died on the stage, her father thwarted her singing career. The charming baron Francis also comes to Les Olivettes each Sunday to mingle with the common folk. According to Madame Pipi, Francis is a good acquaintance of the Belgian Royal family. Madame Pipi is the weekend lavatory attendant who mans her post in the cellar and supplies us with the necessary commentary on the singers. The life of the Les Olivette.s managers, the family Roka, is also inextricably tied to that of the café. Denise and Emile Roka met at Les Olivettes and subsequently got engaged and married there. For the singers, as for the Roka.s, the same thing applies: Les Olivettes gives them a reason for living. Did Jesus Survive The Crucifiction? crucifiction experience and went on to live for many more years. been made to suffer terribly from being scourged. Jerusalem to go and live in the far east. life that we didn't have,so give him the credit due. and I am so thankful I did- I serve a risen Savior!! through 'exhaustion asphyxia' as it is called - the victim suffocated. draws blood away from other regions of the body as well. crucified long enough to have died, his blood wouldn't be 'spurting'. but alive - and hence we have the 'ressurection' of Christ. spent his last days on Cyprus or something. the cross before the Jewish Sabbath commenced, dead or alive. produced an excellent documentary here. 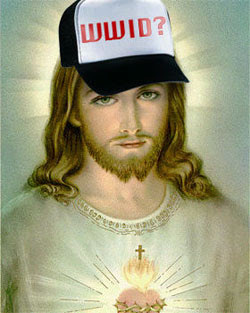 Jesus sired a son with Mary Magdelene. Knights Templar Louis VII and the Prieure de Sion The "Cutting of the Elm"
Earth and are electrically charged in the air. events and is yet to be directly experimentally verified. piezoelectrically by tectonic movements of rocks containing quartz. near areas of tectonic stress, seismic activity or volcanic eruptions. there are few references documenting the phenomenon. although most lights are not so far away. flash in the night high in the sky. back as 373 BC in ancient Greek writings, that "immense columns of flame"
foretold the earthquake that destroyed the cities of Helike and Boura. taken in Japan in the 1960s. earthquake. Several videos were taken. after the earthquake's epicenter in Wenchuan County in Sichuan province. also felt in nearby countries. people lived in the affected area. with Hans Moser, Grete Weiser, Georg Thomalla. The Hofmann family is broke, their oil-business in a German small-town never turned profitable. For this reason, their bank is broke too. Salvation seems to arrive with the uncle form America, whom everybody thinks to be an oil-millionaire. But he's just a poor worker who's spent his last money on a ticket to Germany to see his family (whom, in turn, he thinks to be oil-millionaire). Enter young banker Smith who revives the economy of the region by just pretenting that the uncle has cash. Anyway. The film depicts the new properity of the town with a series of shots drilling and building activities, started off with the would-be cash-cow dedicating a new bridge by. The previous scene and the bridge-scene are separated (or joined) by a simple cut. One wonders: where does the bridge come from? This is how he film covers the non-sequitur: after the cutting of the ribbon, Grete Weiser says to her partner: "Let the other people cross the bridge first. It's been built so quickly, I'd be surprised if it holds." Neat. The meta story of this classic film is the most interesting story of our times, that banks create money out of thin air. Post world-war Germans naturally assume that a texan is a rich person. This perception alone is the reason for all that follows, including the magic generation of big sums of cash in the end. The director Carl Boese (his last name translates to EVIL) remakes his own film from before the war. Is this another hint at the importance of the subject? If you are unsure about the monumental implications you could try watching Paul Grignon's 'Money As Debt' as a primer. The foreground story is well enjoyable, too. Incomparable lead actor Hans Moser is the uncle who returns from 'Amerika' after 40 years in Texas, where he discovers that his 'authentic' experiences in the USA are closer to the German experiences than the German myth about Amerkia allows. Some great comedy develops as he is forced to represent the myth, for example the scene in 'Onkel Toms Texas Bar' (established in his honour) where he is asked to sing a song during the grand opening. The song ends up being a sentimental song about Germany. and ask "How are you"
but here all is double as pretty. I very much recommend this film. A great educational watch, also for children of all ages. A indispensable addition to your film library, worth watching every year, say, on December 23, to commemorate the passing of the 1913 Federal Reserve Act, where the USA joined the international banking system that is determining nearly all human aspirations today. But that's just the meta-story. The film's overt story is a wonderful, seemingly harmless, Christmas-story-like quaint fairy tale, a great watch. I'm always intrigued whenever a film director remakes his or her own work. What do they want to do differently this time? 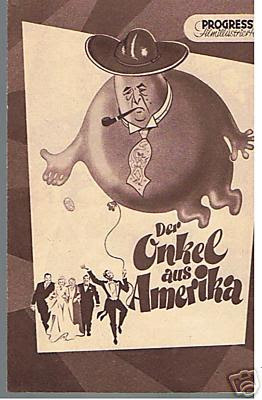 'Der Onkel aus Amerika' ('The Uncle from America'), directed by Carl Boese, is a remake of his 1931 film 'Man Braucht kein Geld'. Each film gives an interesting depiction of Germany (and its relationship with the United States) at their respective moment in time: the 1931 version shows Germany on the brink of Nazism during the throes of Depression which was largely caused by American financiers, whilst the 1953 remake depicts post-war West Germany rising from the ashes (literally) under partitioning and U.S. military supervision. Deutschland 1931. Die Wirtschaftskrise und eine Fehlspekulation treiben den Bankier Binder (Kurt Gerron) fast in den Ruin. Der Bankangestellte Heinz Schmidt (Heinz Rühmann) will wenigstens das Vermögen des Kaufmanns Brandt retten, zumal er bereits ein Auge auf dessen schöne Tochter Käthe (Hedy Kiesler) geworfen hat. Resolut manövriert er dafür Brandts aus den USA angereisten Verwandten Thomas Hoffmann (Hans Moser) in eine abenteuerliche Köpenickiade hinein. Er gibt den ebenso mittellosen wie naiven Besucher als reichen Onkel aus Amerika aus. Im Aufschwung sind alle zufrieden - bis auf Hoffmann, der sich als Schwindler sehr unwohl fühlt. Als die Stadt ihren künftigen Ehrenbürger Hoffmann feiern will, fliegt der Coup auf. Die Honoratioren geraten in Panik, doch Schmidt erklärt ihnen, warum sie an der Fortsetzung des Bluffs selbst interessiert sein sollten. Nun muss er sich nur noch um die nicht minder selbstbewusste Käthe kümmern. Carl Boeses spritzige Situationskomödie karikiert die damalige Wirtschaftskrise, doch die Anspielungen erhalten angesichts des Börsenbooms der Gegenwart ungeahnt aktuelle Züge. In dem Starensemble ist neben Heinz Rühmann auch Hans Moser zu sehen. Hedy Kiesler wurde zwei Jahre später durch einen Nacktauftritt in dem tschechischen Film "Ekstase" berühmt, emigrierte 1938 nach Hollywood und wurde dort als Hedy Lamarr ein Star. Weniger, Bankangestellter, hilft nach einer Fehlspekulation einem Kunden aus der Klemme, indem er den Anschein erweckt, der - in Wirklichkeit verarmte - Onkel aus Amerika sei Dollarmillionär. Hier geht es nicht nur um menschliche Moral, die angesichts des Geldes vergessen wird, hier geht es auch spitzfindig um Wirtschaftskrise, Finanzmanipulation und Politik. Übrigens ist das einleitende Lied "Üb' immer Treu und Redlichkeit" gleichzeitig auch das ironische Motto des Films. Carl Boeses spritzige Situationskomödie karikiert mit bissigen Dialogen die damalige Wirtschaftskrise, doch die pointierten Anspielungen erhalten angesichts des Börsen-Booms der Gegenwart ungeahnt aktuelle Züge. In dem Star-Ensemble sind, neben dem damals 29-jährigen Heinz Rühmann, Hans Moser und Hedy Kiesler zu sehen, die in Hollywood als Hedy Lamar ein Star wurde. Carl Eduard Hermann Boese wurde am 26.08.1887 in Berlin geboren. Nach einem Studium der Theaterwissenschaft, Kunstgeschichte und Philosophie an den Universitäten Berlin und Leipzig arbeitete er als Verlagslektor, bevor er als Dramaturg an das Stadttheater Leipzig wechselte. Während des Ersten Weltkriegs wurde er als Soldat im Jahr 1916 schwer verwundet. Als bleibenden Schaden trug Boese einen gelähmten Arm davon. Danach arbeitete er zunächst als Journalist und meinungsstarker Filmkritiker. Im Jahr 1917 gelang ihm der Sprung zum Filmregie: Als Drehbuchautor und Dramaturg der Deutschen Kolonial-Film (Deuko) ersetzte er den zuvor abgesprungenen Regisseur Georg Alexander bei dem (von Boese geschriebenen) Projekt "Der Verräter". In den folgenden Jahren avancierte Boese zu einem der kommerziell erfolgreichsten Regisseure des deutschen Filmgeschäfts. Musikalische Komödie, die das verklärte Amerikabild der BRD in den 1950er- Jahren sowie fragwürdige Geschäftspraktiken im Zeichen des so genannten Wirtschaftswunders aufs Korn nimmt. Die Story dieses Remakes ist spätestens seit dem Original von 1931 (Regie ebenfalls Carl Boese) bekannt: Durch Hochstapelei und öffentliche Ankündigung eines in Wirklichkeit vermögenslosen Erbonkels einer bankrotten Familien-Ölgesellschaft wird von einem findigen Bankangestellten ein riesiges Geschäft in Gang gesetzt. Das verhilft nicht nur ihm zu einer Braut, sondern lässt eine ganze Kleinstadt in Wohlstand aufblühen. Ansätze für eine zeitbezogene Satire sind zwar vorhanden, wenn etwa die groteske Zukunftsarchitektur und -technik einer neumodischen Wohnung ihr Eigenleben entwickelt, sie werden jedoch so mit Klamauk zugedeckt, dass allenfalls die Hauptdarsteller reizvoll sind. - Für Hans-Moser-Fans bleibt jedenfalls die Genugtuung, dass er auch im Alter von immerhin 73 Jahren mit den Vertretern der jüngeren Komikergeneration wie Georg Thomalla locker mithalten konnte. MARS probe Phoenix -- GERMAN voice? Who was the GERMAN voice announcing the progress of the phoenix landing? Did it come from Darmstadt? received at the European Space Operations Centre. Operations Centre (ESOC), Darmstadt, Germany. 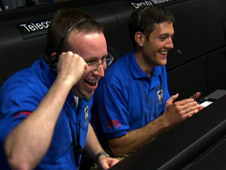 "Congratulations to our NASA colleagues on a hugely successful landing. Paolo Ferri, Head of the Solar and Planetary Missions Division at ESOC. downloaded twice again to ensure fidelity. performance, comparing the actual to the planned trajectory. Germany. NASA has just made the first few images available. Mars Express Lander Communications (MELACOM) system. commands specially designed to support the Phoenix EDL. (SPICAM), were turned on for observations. the lander's descent, and to monitor the lander's performance during EDL. (temperature, pressure and density) above the expected the landing site. the physical conditions in the atmosphere prior to landing. 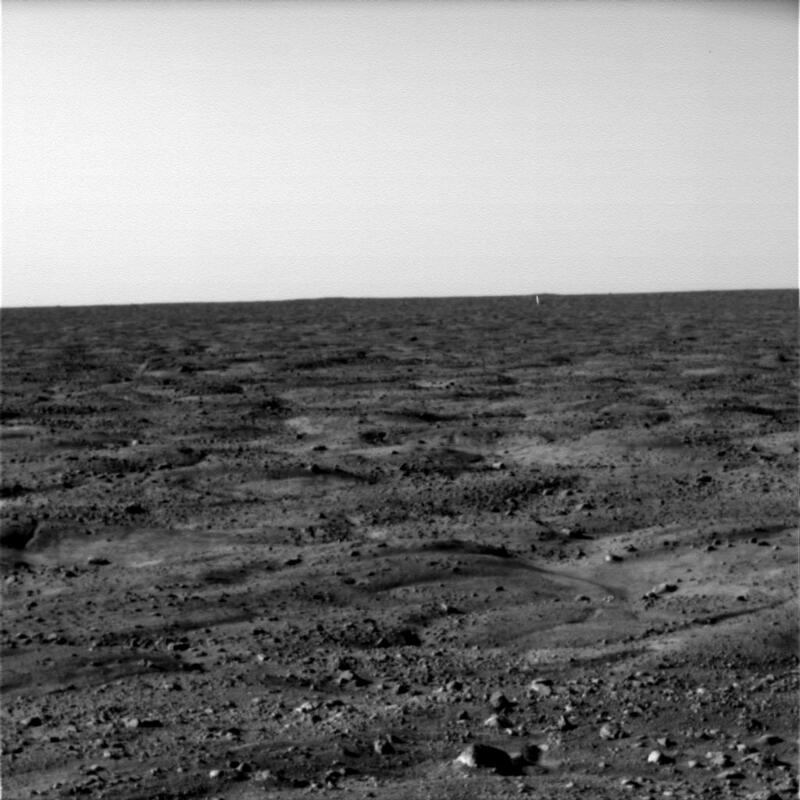 the mission's Martian day, or Sol, 0. A human mission to visit and land on the planet Mars has long been a subject for science fiction writers and a dream of space exploration advocates. Though various mission proposals have been put forth by multiple space agencies for such a mission, the logistical and financial obstacles are considerable, and many critics contend that such a mission would be a risky waste of resources and money. Regardless, preliminary work for such a mission is being undertaken by NASA and the European Space Agency, with each projecting a possible attempt in the 2030s. 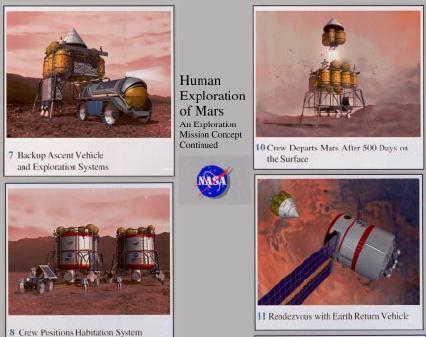 In the mid to late 1990s NASA developed several conceptual level human Mars exploration architectures. One of the most notable and often quoted was the NASA Design reference mission 3.0 (DRM 3.0). The study was performed by the NASA Mars Exploration Team at the NASA's Johnson Space Center (JSC) in the 1990s. Personnel representing several NASA field centers formulated a “Reference Mission” addressing human exploration of Mars. The plan describes the first human missions to Mars with concept of operations and technologies to be used as a first cut at an architecture. The architecture for the Mars Reference Mission builds on previous work, principally on the work of the Synthesis Group (1991) and Zubrin’s (1991) concepts for the use of propellants derived from the Martian atmosphere. The primary purpose of the Reference Mission was to stimulate further thought and development of alternative approaches, which can improve effectiveness, reduce risks, and reduce cost. Improvements can be made at several levels; for example, in the architectural, mission, and system levels. Another proposal for a joint mission with ESA is based on two spacecraft being sent to Mars, one carrying a six-person crew and the other the expedition's supplies. The mission would take about 440 days to complete with three astronauts visiting the surface of the planet for a period of two months. The entire project would cost $20 billion dollars and Russia would contribute 30 per cent of these funds. A ground-based biomedical experiment called Mars-500 simulating manned flight to Mars is planned to start at the end of 2008 in Russia. In 2005 the Mars Society Germany proposed a European Mars Mission (EMM) that could be launched using an improved version of the Ariane 5 booster. The split mission approach was adopted to allow launch of payloads launched directly by this booster from Earth to Mars. Cargo elements would be transferred on low energy, longer transit time trajectories, with only the crew element being sent on a high-energy, fast-transit trajectory. The launches needed to support a mission were spread across two launch windows to allow the Mars surface infrastructure to be pre-positioned and checked out prior to committing crews to the mission. Habitat: The quarters used by the crew for the transit to Mars would be identical to the unmanned surface habitat/ laboratory landed robotically on the first cargo mission. The end-result - identical duplicate habitats on the surface - provided redundancy during the longest phase of the mission. The Mars transit/surface habitat would contain the required consumables for the Mars transit and surface duration of approximately 800 days (approximately half a year for transit and 600 days on the surface). MAV (Mars Ascent Vehicle): When the surface mission was completed, the crew would ride the MAV from the Martian surface to Martian orbit for a rendezvous with an orbiting Earth Return Vehicle. The MAV consisted of an ascent propulsion system and the crew ascent capsule, and was delivered to the Mars surface atop a cargo descent stage. The ascent propulsion system was delivered with its propellant tanks empty. The same descent stage would deliver a nuclear power source (or solar cells), a propellant manufacturing plant, and several tanks of hydrogen to be used as feedstock for making the required ascent propellant. The pressurized ascent capsule vehicle could accommodate a crew of three-five, their EVA suits, and the samples gathered during the expedition and from experiments conducted in the surface habitat/laboratory. Once the docking with the ERV was achieved, all crew, equipment, and samples would be transferred to the ERV, and the MAV jettisoned. ERV (Earth Return Vehicle): This would return the crew from Mars orbit to Earth. The ERV was composed of the propulsion stage, the Earth-return transit habitat, and Earth Re-entry Capsule (ERC). The ERV would be delivered to Mars orbit with the propulsion stage fully fuelled, and loiter there for nearly 4 years before being used by the crew returning to Earth. The propulsion system for the ERV was sized for the velocity change needed to insert the Earth return habitat and the Earth Re-entry Capsule from a highly elliptical parking orbit at Mars to a fast-transit half-year return trajectory to Earth. Soyuz spacecraft: The Soyuz TM, launched from Baikonur or Kourou, would be used to shuttle the crew of three (or two launches for a crew of five) to the Transit Habitation prepositioned in low earth orbit. Launch 1 sent a fully fuelled ERV directly from earth to an elliptical Mars orbit. Launch 2 delivered a vehicle to the Mars surface consisting of the unfueled MAV-1, a propellant production module, a nuclear power plant (or solar cells to be deployed), liquid hydrogen (to be used as a reactant to produce the ascent vehicle propellant), and approximately 20 metric tons of additional payload. The propellant production facility used the hydrogen carbon dioxide from the Mars atmosphere to produce oxygen and methane that were the propellants for the MAV. This production would be completed within a year -- several months before the first crew's scheduled departure from Earth. Launch 3 was optional, but preferred. It would carry the same payload as Launch 2. The second MAV would serve as a backup for the first crew team, and if unused, as the MAV for the next crew. The second propellant production module, power plant , and liquid hydrogen supplies would similarly provide redundancy in case of failures of any elements. Launch 4 was optional as well, delivering a third lander to the Mars surface, This would be an emergency safe haven, consisting of a surface habitat/laboratory and non-perishable consumables. Launch 5 would send the transfer habitat toward Mars. This consisted of a single large module shaped to allow aerocapture in the Martian atmosphere. If the launcher was man-rated, the habitat would be sent directly toward Mars with the crew. If not, the module would be placed in a low earth parking orbit and Soyuz TM spacecraft would be launched to dock with it and transfer the crew before departure for Mars. Stage 1: Six EAP2 MPS solid boosters, each with 253 metric tons of solid propellant. Each MPS would produce 552 metric tons thrust at lift-off, increasing to 600 metric tons before burnout. After burnout 128 seconds after liftoff, they would separate from the main stage at an altitude of 55 to 70 kilometers, continue on a trajectory peaking at 80 to 140 kilometers, then deploy parachutes and splashdown into the ocean 150 kilometers from the launch site. The motors would be built up from seven steel-cased segments. Stage 2: The EPCL ( Etage de Propulsion Cryogénique Large) main cryogenic core stage (EPCL Etage de Propulsion Cryogénique Large) would be primarily aluminum alloy and contain 633 metric tons of Lox/LH2 cryogenic propellants. Three engines would each deliver 410 metric tons of thrust, and be ignited on the pad in parallel with the solid boosters, and operate for 660 seconds. At shutdown the 10-m-diameter booster would be at an altitude of 130 to 420 kilometers, depending on the mission. The stage would be jettisoned at suborbital velocity, and re-enter into the ocean. Stage 3: The ESCB1 extended cryogenic upper stage would complete the injection of the payload toward Mars (including a stay in an intermediate low earth parking orbit if required). The stage would have 67.5 metric tons of Lox/LH2 propellant and be powered by 3 Vinci restartable cryogenic engines with an extendible exit cone and vacuum specific impulse of 455 seconds. Crew Size: 5. Design Life: 1200 days. Mass: 120,000 kg (260,000 lb). Electrical System: Solar Panels or Nuclear. 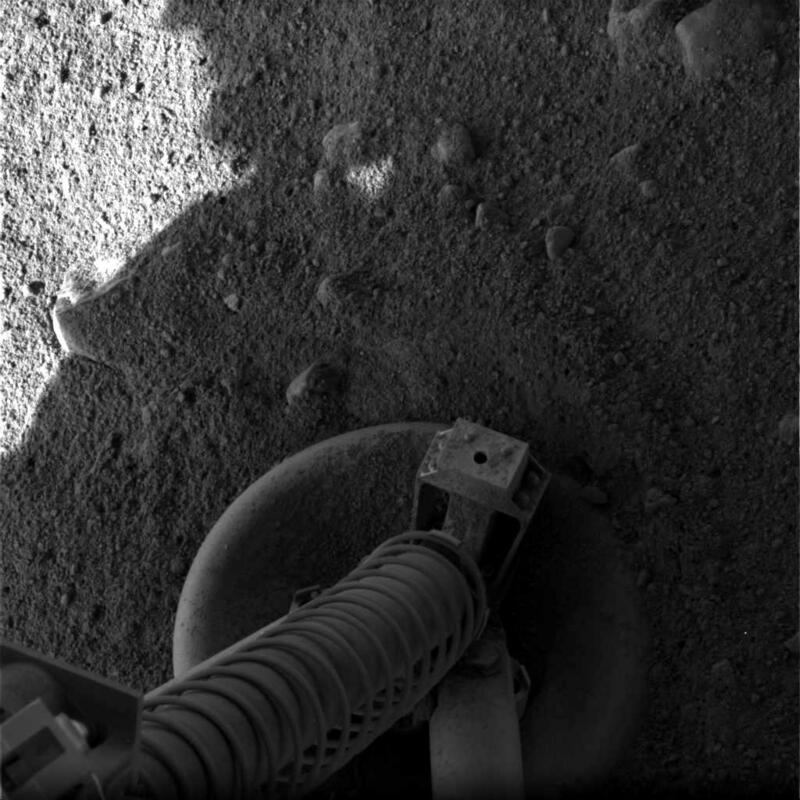 Phoenix Lander -- High Resolution Pictures!! WOW! CLICK ON THE PICTURE to view it even bigger! 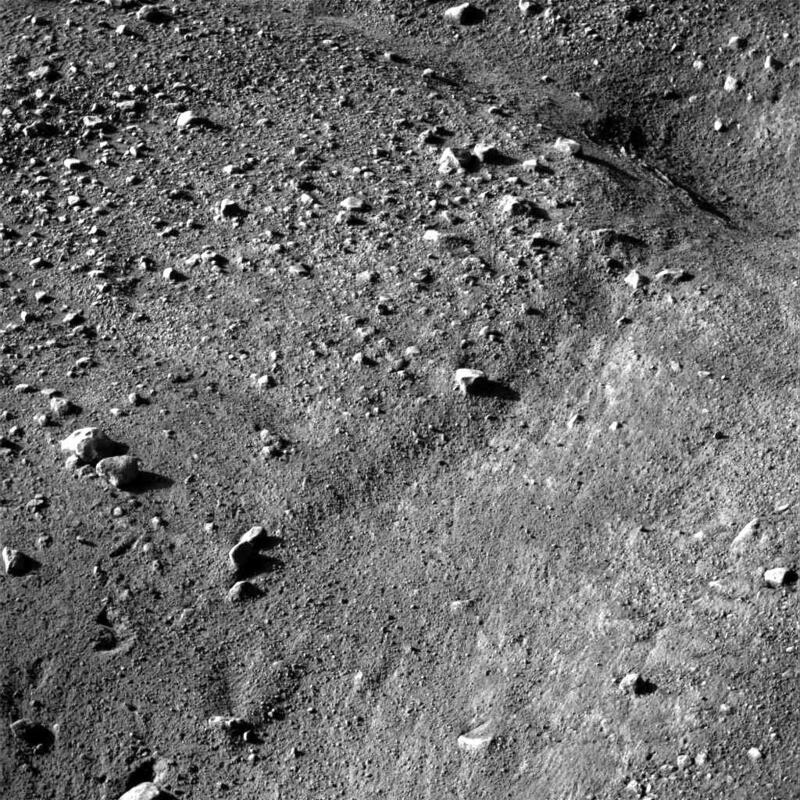 Take a look at some of the first images from Phoenix showing the landing site landscape!! The Surface Stereo Imager Right on NASA's Phoenix Mars Lander acquired the individual images that are combined into this view. The view is presented as a CYLINDRICAL projection. 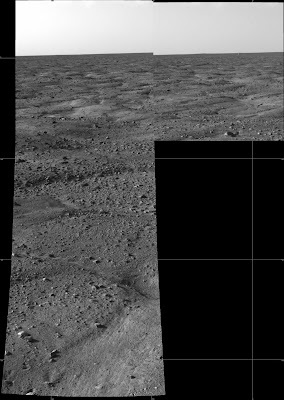 The Surface Stereo Imager Right on NASA's Phoenix Mars Lander acquired the individual images that are combined into this view. The view is presented as a VERTICAL projection.343.319 [deg] The Phoenix Mission is led by the University of Arizona, Tucson, on behalf of NASA. Project management of the mission is by NASA's Jet Propulsion Laboratory, Pasadena, Calif. Spacecraft development is by Lockheed Martin Space Systems, Denver. The Phoenix Mission is led by Principal Investigator Peter H. Smith of The University of Arizona, supported by a science team of CO-Is, with project management at NASA's Jet Propulsion Laboratory and development partnership with Lockheed Martin Space Systems. International contributions are provided by the Canadian Space Agency; the University of Neuchatel, Switzerland; the universities of Copenhagen and Aarhus Denmark; the Max Planck Institute, Germany; and the Finnish Meteorological Institute. Additional information on Phoenix is online at here and here. JPL, a division of the California Institute of Technology in Pasadena, manages Mars Odyssey and Mars Reconnaissance Orbiter for the NASA Science Mission Directorate, Washington. 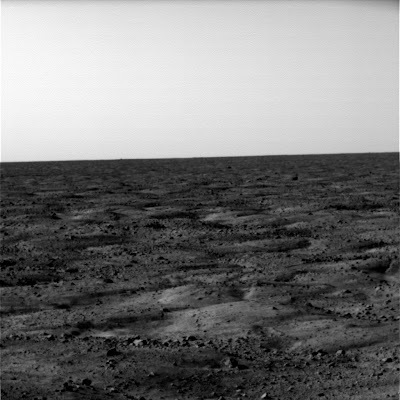 MARS LANDSCAPE at North Pole - images JUST IN!! MORE PICTURES COMING IN BY THE MINUTE!! 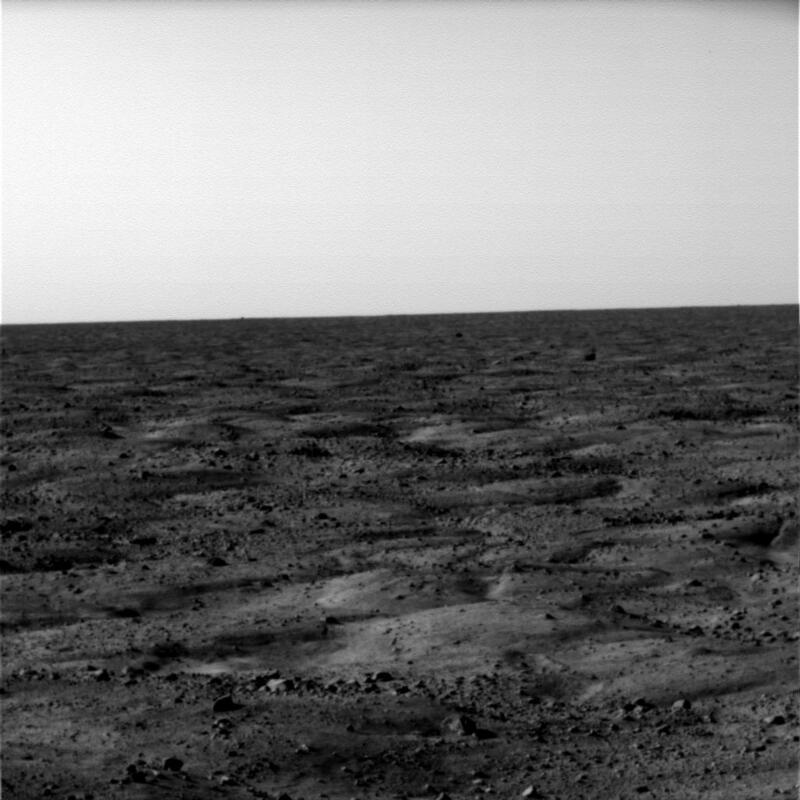 Barren Landscape - No Aliens in sight!! We ARE ALONE! HELP! 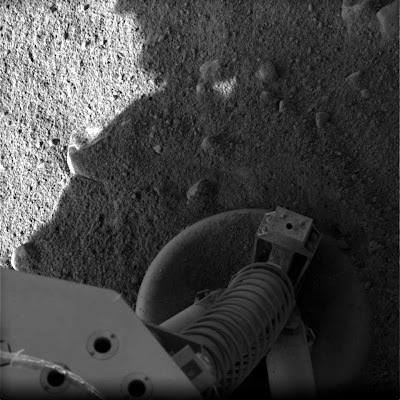 The first photos from Phoenix are streaming back to Earth showing the deployed solar arrays, the lander's feet on the surface, the craft's science instrument deck and the flat terrain of the northern plains. YEY!! 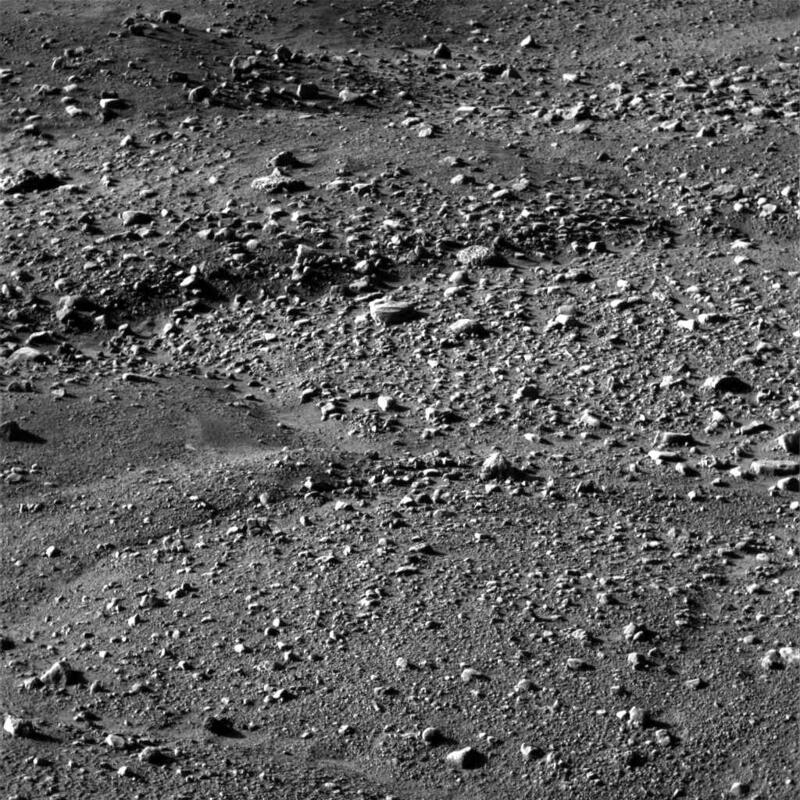 PHOENIX *HAS* LANDED ON MARS!!! -- everyone happy!! wait for 20 minutes for any dust kicked up by the descent engines to settle out. Then, two solar arrays will be unfolded, which will recharge the landers batteries. The landing point appears to be 68.22 degrees latitude and 234.3 degrees longitude. Phoenix' tilt sensor reports it to be sitting on the surface with a tilt of a quarter of a degree! This is as close to perfection as it could possibly get. 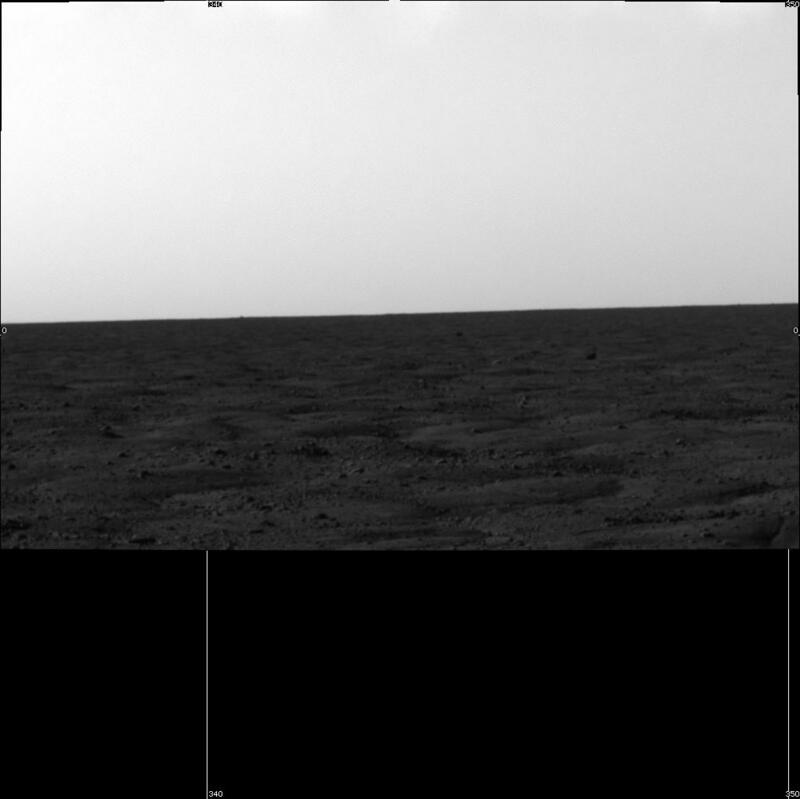 A signal has been detected from Phoenix indicating that the lander is on the surface of Mars. 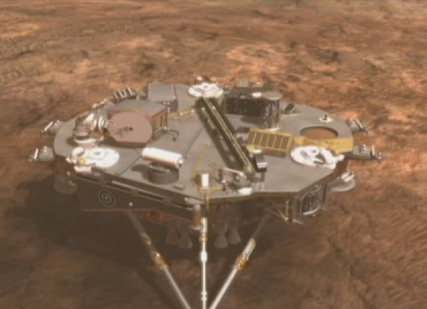 The 420-million-dollar spacecraft has landed on Mars's frigid north pole, where it will dig into the icy soil in search of signs of the conditions that would have made the area once habitable for forms of life. "In my dreams it couldn't have gone as perfectly as it went," project manager Barry Goldstein said. "It went right down the middle." 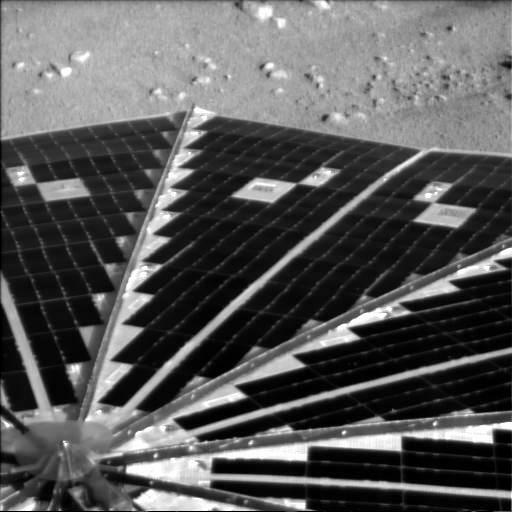 Among Phoenix's first tasks were to check its power supply and the health of its science instruments, and unfurl its solar panels after the dust settled. Mission managers said there would be a two-hour blackout period as Phoenix conducted the checks while out of view from Earth. Like a tourist in a foreign country, the lander initially will take in the sights during its first week on the Red Planet. It will talk with ground controllers through three Mars orbiters, which will relay data and images. Phoenix is equipped with an 8-foot-long arm capable of digging trenches in the soil to get to ice that is believed to be buried inches to a foot deep. Then it will analyze the dirt and ice samples for traces of organic compounds, the chemical building blocks of life. 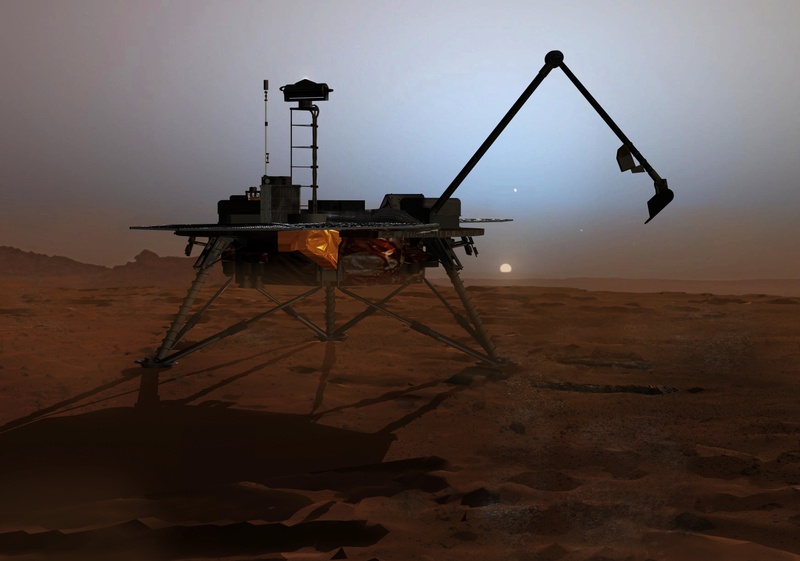 The lander also will study whether the ice ever melted at some point in Mars' history when the planet had a warmer environment than the current harsh, cold one it currently has. Mission managers do not expect Phoenix to survive very long since winter will set in later this year at the landing site with fewer hours of sunlight available each day to power the lander's solar panels. 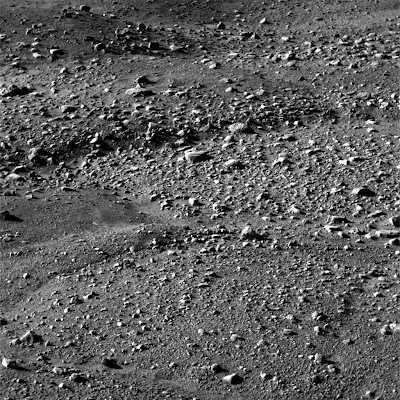 NASA's Phoenix spacecraft landed in the northern polar region of Mars today to begin three months of examining a site chosen for its likelihood of having frozen water within reach of the lander's robotic arm. PASADENA, Calif. -- NASA's Phoenix spacecraft landed in the northern polar region of Mars today to begin three months of examining a site chosen for its likelihood of having frozen water within reach of the lander's robotic arm. 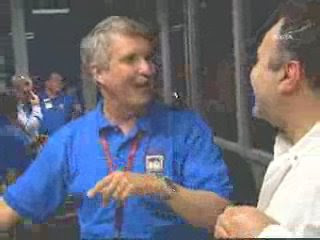 Team members celebrate Phoenix landing on Mars. The Phoenix mission is led by Smith at the University of Arizona with project management at JPL and development partnership at Lockheed Martin, Denver. International contributions come from the Canadian Space Agency; the University of Neuchatel, Switzerland; the universities of Copenhagen and Aarhus, Denmark; Max Planck Institute, Germany; and the Finnish Meteorological Institute. For more about Phoenix, visit http://www.nasa.gov/phoenix .